I've been texting my friend about yarn recently, when we used to text about fabric and quilts and sewing. Now we talk about yarn. It's funny that we seem to have moved together on this. I've been thinking about the ebb of interests. I was a knitter, a knitter first, and sometimes only, up until about six years ago, when I injured my hands knitting and had to stop. My grandmother taught me to knit when I was in elementary school, and would tell anyone when it came up, that I took to it immediately, and knit flawlessly from the start. I don't remember it that way, but I wanted to learn and that certainly helps one learn. I forgot and had to relearn knitting twice more. Once in college, a friend started a knitting group, and I was all, that's a thing I know how to do! I made a hat, it was blue, and it was wayyyy too big. The second time, was around when I got married, a friend of mine visited, and taught me crochet, which I have learned a few times, but never have been comfortable with, and then I remembered the lure of yarn, and went back to knitting. I was living in Urbana, Illinois then, and I joined the Champaign-Urbana Spinners and Weavers Guild, which had a study group for Spinning, Weaving, and Knitting. But I was all about the knitting, but after a while, I was in two knitting groups (one with the guild, and one with some younger people) and this was the time Ravelry fell into our lives, and everyone was knitting, and some of us took a spinning class, and I was hooked, and I was spinning and dyeing, and then I said, well, I'll never weave. Then I bought a little used rigid heddle loom. I knit and I spun, and I thought weaving was my calling in life, but it was such a time commitment, I really didn't spend so much time on it. In the meantime, I had a baby. I made two baby quilts, and was all, why do people do this when there is spinning and knitting? In the meantime, we moved to a larger house, and I was dyeing yarn and roving, and spinning, and doing a little weaving, and planning projects for a weaving book I was going to write. In the meantime, I had another baby, and started dyeing and printing on clothing, because I had trouble finding things that my first child would wear, that I approved of as well. I dyed fabric too, and started a little quilt because what else could you do with it? In the meantime, the loom had to be packed away, to make room for a doll house. Or a computer, who can remember? In the meantime, I hurt my hands knitting, repetitive motion strains, and had to do something for a hobby, and spinning, which I could still manage made little sense when one could not knit. However, I had been sewing all my life as well, and a fellow mom I meet through my first child's preschool brought me to a sewing event hosted by Rae of Made by Rae and Karen of One Girl Circus. 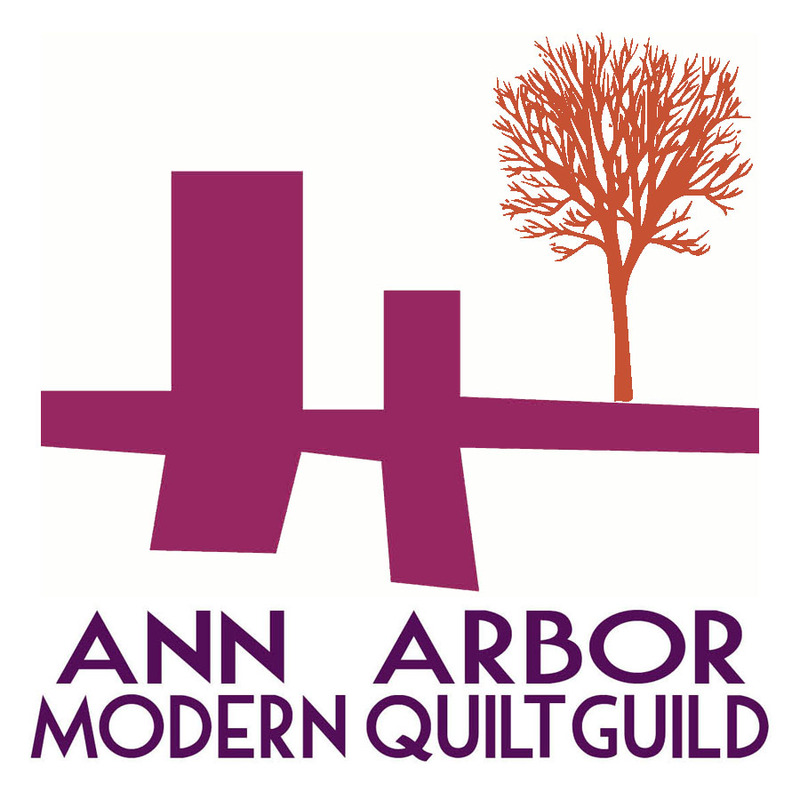 Where I met Brenda, the owner of Pink Castle Fabrics, and from where I fell into the Ann Arbor Modern Quilt Guild, and quilts began to make sense to me and then it was The Thing. Then five years later, six years? Several months ago, we moved to a larger house. My new sewing room was bigger, but had no storage, so we got shelves built in. It took months, and my sewing room was mostly packed during that time, although I had a machine on a small table and a tiny ironing board in the living room. But with all the moving, things that had been left in the basement had come out into the open. And tired of not being able to work on my whatever quilt it was at the time, I pulled out my loom, and it was all, oh wait, I love this. And I have room to have them stay out. And now I think in yarn, again. I'm doing warp math again. I've made a few scarves. I bought a 4 harness loom off of craigslist, which had apparently been in someone's basement for 30 years, and bought new parts to get it running. I got it warped up, and it's been driving me crazy since, but I am almost done with that first project. And I thought, the weird thing is, I have never taken a weaving class. So, at the very end of 2017, I did. I went to Mechanicsburg, PA to take a class at Kite Tails Weaving Saori Art Studio, which is the closest Saori weaving studio to us in Southeast Michigan. Here is the piece I made in the class. 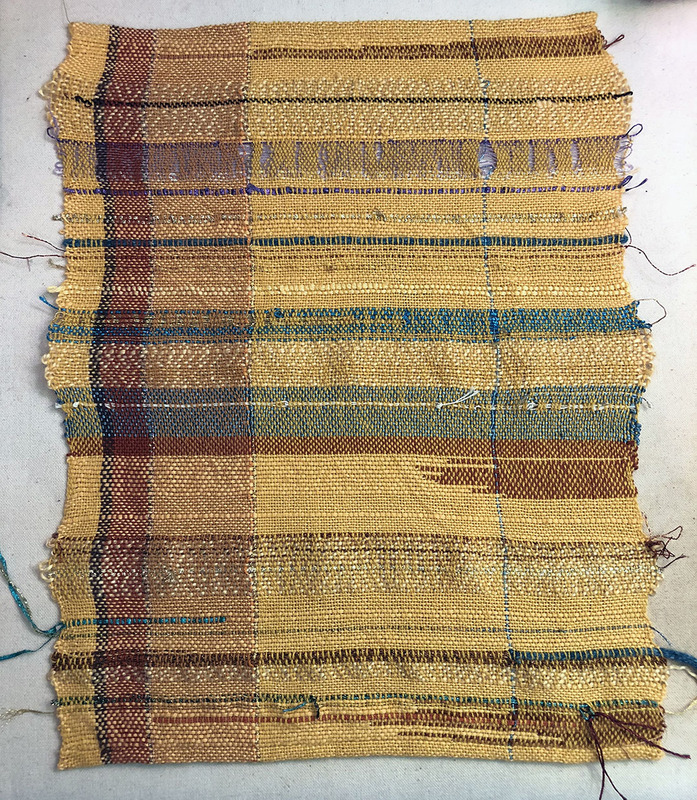 Saori is, in a vast simplification of its philosophy, a more intuitive sort of weaving, which is what is more aesthically appealing to me than the traditional weaving. (Which is beautiful, but it is more a mentally taxing thing than I find enjoyable in a hobby.) I found out about it by going back to Ravelry and joining all the weaving boards, looking, of course, to pick up more yarn. It is mentioned with reverence and with horror and everything in between. If you want to see some examples, there is a group on Ravelry, there is one on Facebook I hear, but mostly, I search #saoriweaving on Instagram myself. After I came home from the class, and spent some time in bed with a cold, and wove two scarves, I designed a funky warp to try out and wove it Saori style on my rigid heddle loom, using bits of metallic string with my more usual cotton yarn, and wove this piece, once it was washed some interesting things happened, because the cotton shrinks, but the string didn't. Leaving all my knots showing. Right now I'm working on finishing the piece on the 4 harness loom, so I can start something new there. 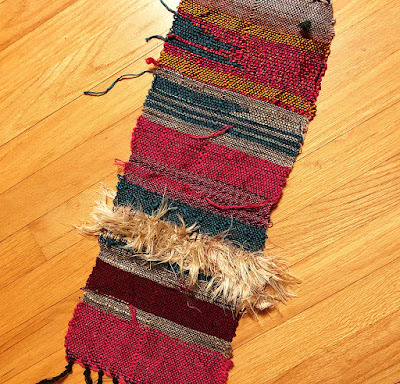 I've a plan to warp the rigid heddle, too, but I haven't done it yet. Hopefully this weekend. And concurrently I've started a new quilt, because there is not bad time to start a new quilt.